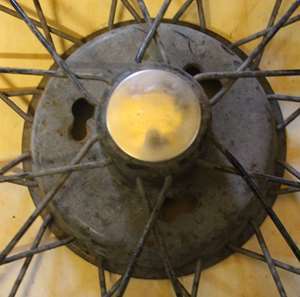 ﻿ Austin Seven Rear AXle - Light or Heavy? Austin Seven Rear Axle - Light or Heavy? The Big Seven was launched in July 1937 with a three quarter floating type axle with spiral bevel and the torque tube fitted to a short shaft with Hardy Spicer univeral joints and was known as the 'light axle'. It suffered key and shaft failures so it was redesigned; the shaft diameter was increased from 0.890" to 1.015", with minor alterations to the crown wheel and pinion and the axle casing was changed to provide greater strength. 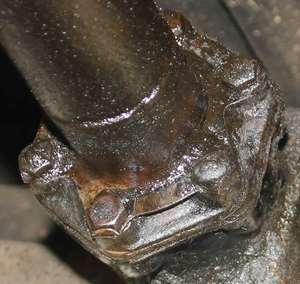 The new axle was referred to as the 'heavy axle'. The heavy axle was introduced with chassis No: 5687 but until the stock of light axles was used up some cars were fitted with the light axle until the heavy axle became standard with chassis No: 7841 in March 1938. Larger bearings were fitted, the hubs modified and the bore of the brake drums increased. The front hubs were modified so that the brake drums were interchangeable front and rear. Earlier Big Sevens fitted with the heavy axle were chassis nos: 5687; 6771; 6963 to 6967; 7172 to 7174; 7238; 7401; 7416; 7438; 7445; 7607 to 7616; 7640 to 7700; 7719 to 7761; 7777; 7815 to 7820 and 7831. Then from chassis no: 7841. Big Sevens were fitted with Easyclean steel wheels with three holes for the studs from introduction in July 1937.. The heavy axle appeared from chassis No: 286571 in July 1938. The heavy axle was fitted to both Big Seven models and the Ruby MK2 until the production ceased in early 1939. What is the difference between the two axles? 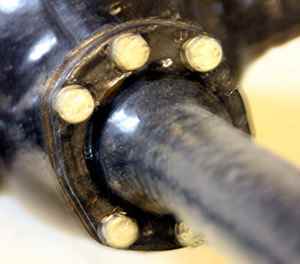 The torque tube is attached to the differential by an hexagonal shaped flange. On the light axle the joint is made with three bolts along the top, and three bolts along the bottom, of the flange. On the heavy axle the six bolts are arranged evenly spaced in a circle, each one at the corners of the hexagon shape, providing a better seal for the joint. Fitting the heavy axle to the Ruby MK2 (ARR) . . . . .
. . . . . required changes to the brake drum and wheel hub. 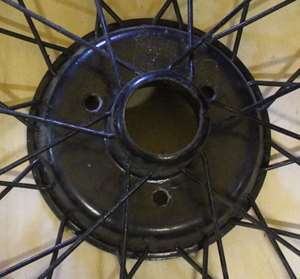 The brake drum fitted to the light axle on the MK2 since its launch has three lugs into which the wheel hub is located with a slight turn before the studs are correctly positioned for the wheel nuts to be tightened. 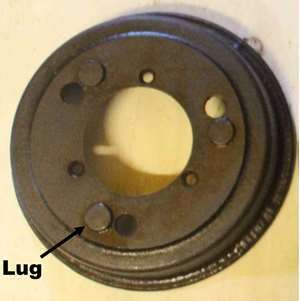 The brake drum fitted to the heavy axle has three holes for the wheel studs . 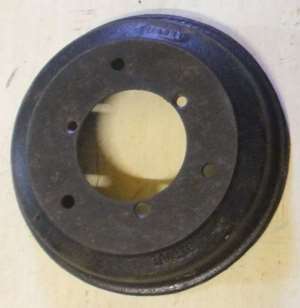 . . . . .
. . . . . which are replicated on the wheel centre to locate the studs. 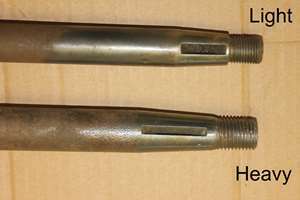 Along with the increased half-shaft diameter from 0.890" to 1.015" the length of the taper also increased, a longer shallower key fitted, and larger bearings. The outer end has a different thread and nut. The hubs, bearings, brake drums and wheels are not interchangeable between the two axle types. The Austin Seven Source Book by Bryan Purves pub. Haynes Publishing p 477. The Austin Seven List of Production Changes 1922-1939 compiled by Dave Martin. pub The A7CA 2016. p 52. This article was written by Doug Castle and Andrew Jarmin, October 2016.